There's been plenty of confusion lately about the launch of the 3DS's eShop, which will allow users to download DSiWare games, 3DS demos and more. At first we believed the store would be ready at launch, then Nintendo Japan's financial results claimed the 3DS eShop would launch in May. Now Nintendo America has clarified that at the very least the Virtual Console will be available on the console's launch day, according to an article by IGN. It's important to note that some of these features, most notably the Virtual Console/e-Shop idea, will not be available out of the box, but will need to be downloaded from a Wi-Fi connection. 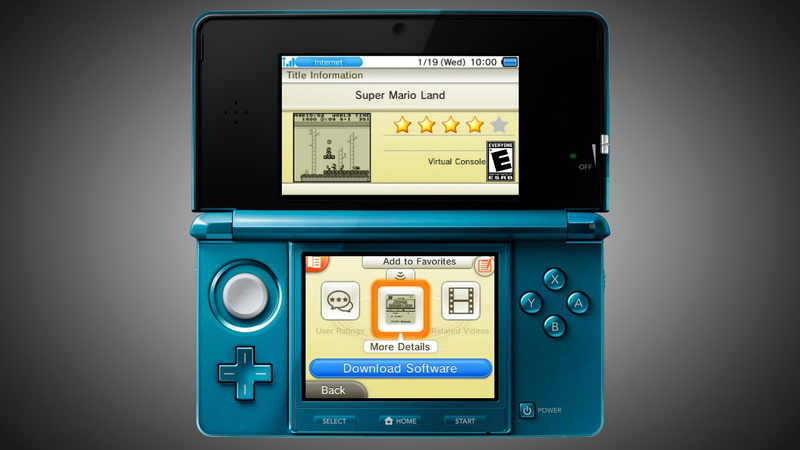 Nintendo has clarified that the Virtual Console will be available immediately upon the launch of the 3DS. So far the only titles confirmed for the system's Virtual Console are Super Mario Land and Legend of Zelda: Link's Awakening DX, but expect other titles to hit the shelves on launch day. As with our world-beating Wii Virtual Console service, we here at Nintendo Life will review every single game released for the 3DS Virtual Console which, combined with our DSiWare reviews, creates an unassailable library of digital download review goodness. Nice. UPDATE: IGN has since changed their statement about the 3DS Virtual Console being available on launch day in their "3DS Buyer's Guide" and now state that the service will indeed come in the form of a system software update in late May, as previously stated. Below is the snippet from their guide which shows the change. We apologize for any inconvenience this misinformation may have caused. Super Mario Land, here I come! Seems like they change their minds all the time.. Must be a lot of misunderstandings between statement and when it finally reaches us. Thank God, I would have died if I couldn't play old games on my new hardware. Boy if only the new games looked good at launch. Joy to the (gaming) world!!!! Great news. Not really interested in the games. I still have the original GB cartridge of Super Mario Land and Link's Awakening (althoug not the DX version). My only minor disappointment (honestly) with getting this on launch was the lack of Virtual Console. Assuming this applies to Europe as well, this is fantastic news! I can't say it's too exciting since it's limited to GB and GBC games. Surely the thing can emulated GBA games too? And (and sorry for the second post)... what about other company's handhelds? Why not Sega GameGear? Atari Lynx? Neo Geo Pocket? Etc? Last comments about the store being a download in May came from Nintendo Europe... who usually have NO IDEA about what's going on. @Crunc: If the Wii virtual console is an example of things to come, we can expect Game Gear, Lynx, Neo Geo Pocket, NGP Color and Wonderswan to be added eventually. Too bad I have both of those games already. Zelda is the dx version, though. I've got the monochrome game. Hooray! Unfortunately, I own most of the best GB/GBC games already. Good. Hopefully the story is straight this time. Now all I'm waiting for is pricing of the VC games and NA 3DS launch title list to be announced. This here is one of the things that makes me stick with Nintendo Life. You guys review all of the WiiWare, DsiWare, and Virtual Console stuff that no one else reviews. Make up your freakin' minds dang it!! Effin' yeah! I'm buying them both. And we Virtual Conosle die hards rejoice! Man, if Virtual Console and DSiWare are available at launch, I'm gonna kill my wallet ! Will they be in 3D? Nintendo changes their minds like a girl changes clothes. Only some games will be remade for 3D. The others will stick with 2D goodness. Somehow I think the eShop application will be available but only the VC games will be up for purchasing. There's a score rating for the game while your in the 3DS Shop Channel? I'd rather have the original cartridges by far... But I still might buy a few. Given that eShop is supposed to come out in May, shouldn't this statement be taken with a grain of salt? I don't think it's good to believe everything IGN says just cause they're the biggest news site. Wouldn't we hear something about Japan's VC launch lineup by now if this were the case? I guess I'll enjoy this news with the proverbial grain of salt, until IGN, NOA or NOJ post some kind of retraction, LOL! Availability date of eShop bouncing back and forth like Forrest Gump playing ping pong! Hopefully they keep up with the weekly updates? This is great news!!! I hope other consoles are added to the service on time. Are dsiware, 3dsware and the internet browser are stil coming in May Then again, I wouldn't be surprised if IGN were wrong, since we'd probably know the japanese 3ds vc launch games by now if this were true. Now what about being able to transfer my DSiware that I have now? Is that going to be available day 1 or will I have to wait? At this point I will get the 3DS day one (paid off by trades and a gift card) but if I can't transfer right away, I will just test to make sure my system works and then put it away until the update hits. Otherwise when I do a user transfer to my 3DS from my DSi, any game saves would go away and it would become a new system again anyway. Boy my head hurts. With the only two games they've announced being instant win already, who knows what else we can expect. Goodness if they added the original pokemon games and dare I say, Wi Fi. I'd say sanctuary. This is huge news for me, since those titles appeal to me and I have no idea what the retail launch looks like. Hmm, perhaps I will get this closer to launch than previously expected. Might just go ahead and grab one at launch now. Not sure though as I still needa confirmation on a DSiware transfer solution. Awesome news indeed! I imagine the review crew at Nintendo Life will be fighting over who gets to review these games first! I wonder what the Earthbound/Yoshi's island of the 3DS virtual console will be? Taking all bets! @booker_steve Despite the fact its on many's wish lists, I bet original pokemon will be nono, let alone wi-fi enhanced versions. I hope for Lynx and Game Gear games as the screens are too outdated to play nice in these days. Neo Geo Pocket will be a doubtfull system, most games are fighters and impossible to play with the 3DS, cause there is no 8 way joystick. Even though Faselei and SNK vs Capcom CFC would be great. Sadly there is no English version of CFC2, played it completly through in Japanese and it's my favorite cardfighter. Link's Awakening is my favourite LoZ game. This is excellent news. I've seen a video fo the 3DS emulating Super Mario Land for the GameBoy and it seems to do it flawlessly. Pixel for pixel without discolourisation. I'm probably as excited to play 3D content as I am to play the retro VC titles. Cool but not to thrilled. I really wish they'd reveal the launch line-up. Dang make up your mind Nintendo. The anticipation is killing me. Now I wait for Metroid 2 Return of Samus! Finally my long lost game will be returned to me in time. Sooner hopefully rather than later. I'll keep my fingers crossed for GBA games possibly in the future. I canceled my pre-order because they said we'd have to wait (thus I wouldn't have any games until June) and I spent my money on a PS2. Finally! I never actually played Super Mario Land, and I did own Link's Awakening, but the save battery ran out before I beat it and I never got another copy. Hoping for GBA, Neogeo Pocket, Wonderswan etc. games at some point. YES!!! This made my whole day!!! I was sooooo looking forward to playing SML day one and was crushed when they said eShop won't be out day one. Thank God that didn't mean virtual console though!!! I love the 3DS. Awesome news, but I don't get why that can't also have DSiWare available at launch, too? If they do put, say, Pokemon Yellow on the VC, I will be getting it on day 1. I loved Yellow, mainly because JandJ was on there, and you could get all three starters. I'm going off topic here. Yay! VC!!! Really do look forward to the future of the Virtual Console. I'll keep my expectations low to 1 games a week so I won't end up being disappointed, but still, many games can still come. @MrMagpie: I think we'll see the Pokemon games eventually. They were incredibly popular back in the day and it's not like the original remakes are still giving Nintendo money. The only thing that might prevent it from being on the VC is the Jynx "blackface" controversy, which can easily adjusted (And may not need to be adjusted for VC release anyway since the Pokemon controversy has since faded away and no parents are really complaining about it). Even if it doesn't come, I don't think it'll be the Earthbound regarding the VC since Earthbound was pretty unpopular back in the SNES days. We'll have to think of something more obscure that people want to play nowadays yet has legal issues. So far, I got nothing. I could never see myself buying any virtual consoles. I could never bring myself to do it. However unlikely, I would like to see them eventually bring classic home console games to this service with small updates, such as online multiplayer. I'm absolutely getting both of these; I might even try to brave the launch chaos just for them. I only ever briefly played Super Mario Land, and Link's Awakening DX is the greatest portable game ever made. Plus, I'm sure the battery for my copy of LA is going to sputter out any day now, so the timing feels right. Anyway, I may have missed it, but have we received any word on how much GB/C Virtual Console titles are going to cost? Link's Awakening and Super Mario Land here I come muhahaha. Well, now i'm more on board to get the system at launch. Guess i better get my pre-order down. Yay! I still don't know what game to get at launch. Wait, never mind, I think your name says it all. Make up your mind, Nintendo! wait, so the eShop IS going to be available on launch day?! Make up your mind, IGN! Darn it... IGN has been feeding up a cake full of lies! why do you guys still go to ign lol im not saying they're bad but why continue to check out a site you dont care for or hear so much negativity about. This is proof that IGN is an unreliable news source and video game reviews website. Well this is awesome news! OMG! OMG! Now thats so damn awesome!! Super Mario Land and Zelda Links Awakening DX, cant beat that on the first day of launch!! I cant wait! Woohoo!! 42 more days to go!! I sure wasted that grain of salt earlier. Like I said, "ping...pong". So are you guys ever going to update this story? @tbd: Corbs commented on this in the forums. Oh boy oh boy oh boy oh boy oh boy oh boy oh boy oh boy!!!!!!!! This means that, just like when I got my Wii, I won't need to get any hard-copy 3DS games! It's just as well, because none of the 16 launch titles are appealing enough to be insta-buys for me. Awesome! By the time I actually get a 3DS, they'll have tons of titles!! Silly IGN. Silly Nintendo. Wonder how the people who never go online with their system will find out about this. I think Nintendo have already shot the Handheld VC in the foot. This means that, unlike when I got my Wii, I won't be able to get any digital 3DS games. It's disappointing, because none of the 16 launch titles are appealing enough to be insta-buys for me. Grrr.. IGN! Changing everything against Nintendo! News stories, review scores, layouts, ownership, YOUR STUPID FACE!!! FANBOY RAGE!!! ...ah well. More time to build a robust library of games. Nintendo should offer this Super Mario Land as a free gift to every new console buyer (inbox redemption code or something), to compensate for the delay. @118: Compensate for the delay? They're withholding a service for a couple of months, they didn't run over your pet. Pardon the unoriginality here, but I guess you just can't spell ignorant without ign. Oh well. So I'm back to finding some DS games instead of VC. I'll survive. Awwwwww. Well I won't have my DSi by then. How am I supposed to transfer my stuff? I guess I'll just have to put up with PilotWings Resort, SMB3D and SSFIV3D until May. Don't mine I'll just play Super Street Fighter 4 3D on March 29.
quickly losing faith....anyone know of any good nintendo news sites? @Swerd_Murd I hear Nintendolife is a good Nintendo news site....maybe you should check em out. i kid. This is a really huge fail for nintendo given their system's history's of low connection rate. Many launch day buyers will be the "hardcorz" who are nose into websites like this, but most likely many won't be as well, and will buy it because they think it's a fun gimmick. The Wii shop was on the menu at launch, and connect rates are still dismal. Spotpass is really the systems only saving grace here, as it will receive updates automatically. Even then, you have to hope that enough people will take the time to input their network passwords to connect the system online for Mario Kart or Pokemon for that to even be set up. I bet there will be many who won't. Nintendo's been making a lot of fuss about the 3DS's online features (Spot/Street pass seem to get more attention than 3D at press conferences), but choosing to not have the most profitable online feature available from the get-go in a market that has shown to not go out of it's way to get online is a pretty massive fail. Even if there are no dedicated "3DSWare" games available at launch, there's still plenty of DSiWare, and it shouldn't be that hard to throw up a couple of VC games. Use the old DSiWare shopfront for a couple months if you have to, but give people SOME incentive to get online! @Token Girl: Well I'm sure they had a good reason to postpone it anyway. I'd rather have a good eShop than a half-*ssed mess of one. What gets me is that people spend hundreds of dollars for a new console and THEN don't go out of their way to learn all they can about it. How do you spend that much and NOT know you can go online to download VC/WiiWare games, and use the internet? I think part of it must be that a lot people are either unwilling to spend the money for a router/high speed internet, or they simply don't have the money to shell out every month. A lot of internet plans out there are expensive and I'm sure it's too much for a great many people in this rotten economy that's seeing little (if any) improvement. Of course I'm sure some simply won't bother to read the Wii's instructions and find out that there are Shop & Internet Channels! Mind-blowing, because for me, VC was THE big selling point for buying the Wii (though I'd have gotten it even without a shop, as I always get Nintendo's newest system, unless it's just an update like Game Boy Micro and such). MAKE. UP. YOUR. FREAKING. MIND. NINTENDO. GOD. Those who said something along the lines of "Hmmm, I'm skeptic" have just scored a massive amount of points. Also, thank you IGN for your misinterpretation! At this point, I would give both my left testicles for the 3DS. What about your existing games library you already have downloaded from DSi Ware when will you be able to copy them across to your 3DS aswell? damn it, IGN! For once write an article that isn't speculation or FPS-orentiated! WHA?!?! Did that say DSi to 3DS was coming out in late May?! Great now we just need some Final Fantasy Adventure, Ninja Gaiden Shadows, and Kirby's Dream Land 2 in there and the library would be solid. YEEES!! 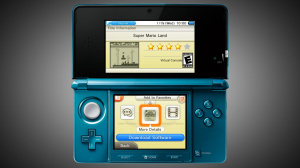 I am so getting Super Mario Land! No. The eShop is coming late May. Yes. Download your current DSiWare to a SD Card, put your SD Card into your 3DS, Copy your DSiWare from your SD Card to your 3DS, then done! Note: This can only be performed a limited number of times, so be careful!